Keeping your home looking beautiful all year can be difficult for even the most tidy homemaker. Clutter can build up inside and outside of the home, and this can often be seen as an invitation to unwanted insects and rodents. Depending on the type of clutter that accumulates, this junk can attract rats, mice, cockroaches, ants, and other unwanted creatures. Exterior clutter that gathers on the side of your home may welcome similar insects and pests, and you need to be very cautious about termites and spiders finding points of entry in these clutter stacks. Most homes that have infestation problems realize after the fact that it may have been avoidable. So how do you avoid inviting unwanted critters into your home? Keep reading to learn more, or visit a pest control specialist like https://greenhomepest.com/ to get more information about specific insects and the treatment options for each. We say this time and time again, and yet people continue to leave junk lying around the yard. The garage also can quickly become a storage unit for many homeowners, depending on the clutter that accumulates, the garage can also become a resting place for rodents and insects. If there is food and water available in the garage, this dark shelter is an ideal location for any critter looking for a safe place to nest. Clutter on the interior of the home can also be an issue for many, insects and critters love to hide under things, when clutter collects in the home it gives them quick access to shelter when the lights turn on. Clear the clutter! Pest control maintenance will allow you to stay on top of the basic control need for your property. Having the property treated regularly will help to keep the insect population down. Ants, spiders, cockroaches, scorpions, crickets, and other insects that may be common in the yard can be controlled with regular treatments. Most pest control companies will treat a property monthly or bi-monthly depending on the needs of the home or business. If regular treatment is not an option, homeowners and businesses should definitely be taking all precautionary measures necessary to avoid a pest infestation. 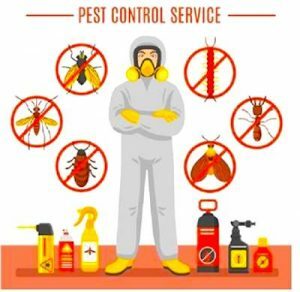 Pest control starts with the occupants of the property, and continues with professional treatment from local pest control agencies. By leveraging the power of nature to repel insects for you, you can make your job of controlling pests on your property much easier. This process doesn’t need to be difficult. You can search the web for plants the grow well in your area and that naturally repel insects. By doing this you can limit the amount of insects that enter your property and make it their home. Limiting that, will limit the number of insects that will enter your home from exterior openings. You can also use things like citronella garden candles to keep insects like mosquitos away.